The European Health Insurance Card (EHIC), which replaced the old E111 in 2006, lets you get free or reduced-cost healthcare in Europe. The card is provided by the NHS free of charge. A few years back, most people looking for the application form would type EHIC into Google and click on the first link returned. This created a golden business opportunity for shady operators, who bought Google advertising on the search term ‘EHIC’ so that their website was returned ahead of the official NHS website. This result was flagged as an advert, but vast numbers of users didn’t notice and clicked on it anyway. Having diverted the user away from the free official website, the rogue website would present an application form charging £15 or more per applicant. A Daily Mail/Consumer Focus joint investigation reported in 2011 that ‘experts believe around one in seven of the eight million UK citizens applying to renew their European Health Insurance Card (EHIC) this year have unwittingly paid up to £20’. It is applyehic.org that is the focus of this post. Its adverts were finally removed from Google in June 2013 after the Guardian intervened: ‘According to Google rules, websites offering application checking and other similar services have to make it clear they are not the official site, but too many hide these disclaimers well down the page, often out of view. This week Google removed one of the worst offenders from its ads – Applyehic.org – after we pointed out it appeared to be breaking the rules…’. So, one of the biggest and the worst examples of this scam. And scam it was: the business model only works by tricking people – who would knowingly pay £15 and give their personal details to a shady operator for a service free from the official NHS site? 1. As the Guardian observed, the disclaimers were at the bottom of the page; the Apply Now button was at the top. The front page was very tall, and on regular screens the disclaimers would not have been visible without scrolling. Also near the top of the page was the text ‘Official NHS Website’, which was cited (comment from ElsieLC, 13th September 2012, here) in one victim complaint about applyehic.org (it was in fact a link to the official NHS website). The page was a masterclass in social engineering – salient facts were buried in the middle of nearly 800 words or out of sight at the bottom of the page; people in a hurry trying to book a holiday weren’t likely to scroll through all the text or do more than scan the page looking for the Apply Now button, perhaps fortuitously alighting on key phrases like ‘Official NHS Website’. Page archived here. 2. We note an ApplyEHIC promotional video on YouTube. 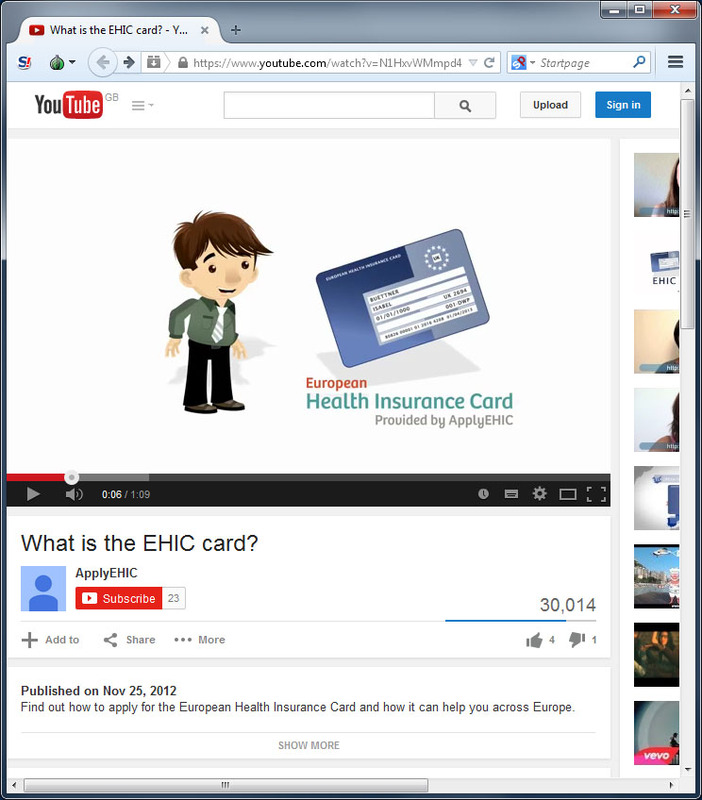 The video makes no reference whatsoever to the EHIC card being available for free from the NHS site, and shows a picture of the official EHIC document with the accompanying text, ‘European Health Insurance Card Provided by ApplyEHIC’. The viewer was highly likely to obtain the impression that ApplyEHIC was the official provider. 3. An interesting touch was the ‘Optional express application with cover from today’ for a £5 additional fee. ‘cover from today’ sounds like something worth having if you’ve left your application late, but is in fact a standard feature of the (free) NHS EHIC application process (‘If you made your application over the phone or online, you are covered for travel from the date of application.’). In acting as a wholly unnecessary intermediary between the applicant and the NHS, applyehic.org stood only to delay the start of cover compared to a direct application. 5. 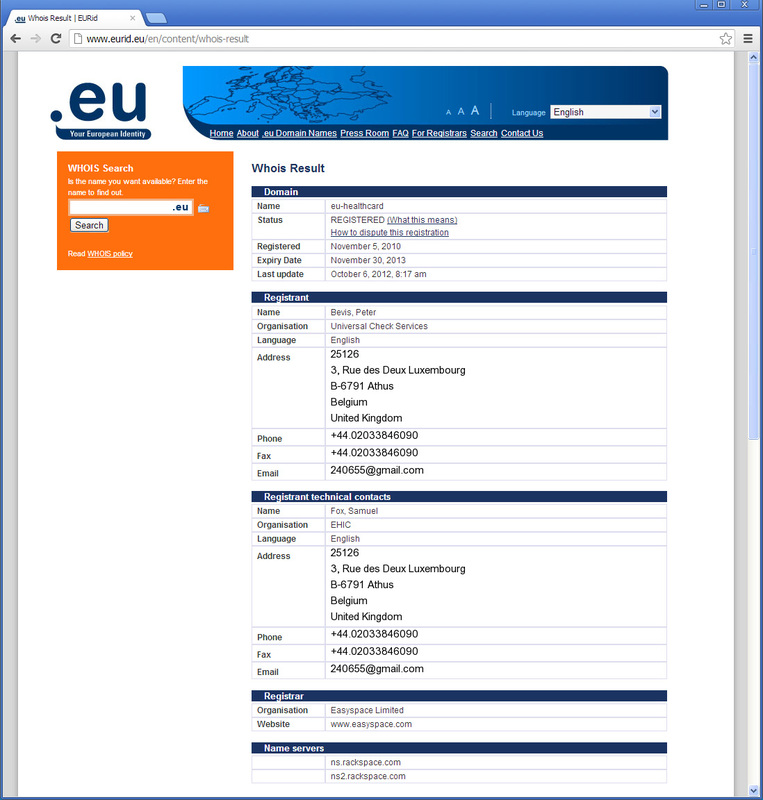 We note the site eu-healthcard.com, created September 30th 2010 by the same operator, screenshot from November 9th 2010 below. The first graphical element to appear on the site features an NHS logo (usage of which is tightly controlled by the NHS). The disclaimer text states that the site has no connection to the NHS, but the image is more likely to be absorbed than the disclaimer text. 6. We note the site e111-nhs.org, created February 12th 2011 by the same operator, archived here. Use of a domain name ending ‘nhs.org’ is likely to reinforce the impression that the site is official (as in this victim account). Similar domain name registrations have been ruled ‘misleading’ by the ASA and ‘abusive’ by domain name authority Nominet. 7. Finally, we note the great lengths to which the operator has gone to conceal their identity. The contact address on the website was a mailbox in Belgium; the WHOIS record for domain applyehic.org was at the time hidden behind privacy protection; and the UK contact address required by the Data Protection Register (‘EHIC LTD, CLIFTON HILL HOUSE, LOWER CLIFTON HILL, BRISTOL, BS8 1BX’) turns out to be a University of Bristol hall of residence. But despite the operator’s efforts, their identity is known. 1. The IP address of applyehic.org was 5.79.61.248. This is recorded in the sitetrail.com page below (and in many other places). This IP address was allocated to ‘Lochaber Highland Estates’ (company renamed in 2012 to ‘Highland Titles’, known for their ‘Laird of Glencoe’ product) by Rackspace UK. applyehic.org currently (8th March 2015) shows as registered to a Belgian antiquarian bookseller whose wife’s family, curiously, owns an 8,708 hectare estate in Glencoe. There are a number of reasons to believe this registration is an attempt at misdirection, not least the fact that it only appeared after the site was effectively put out of business by the Guardian. 2. 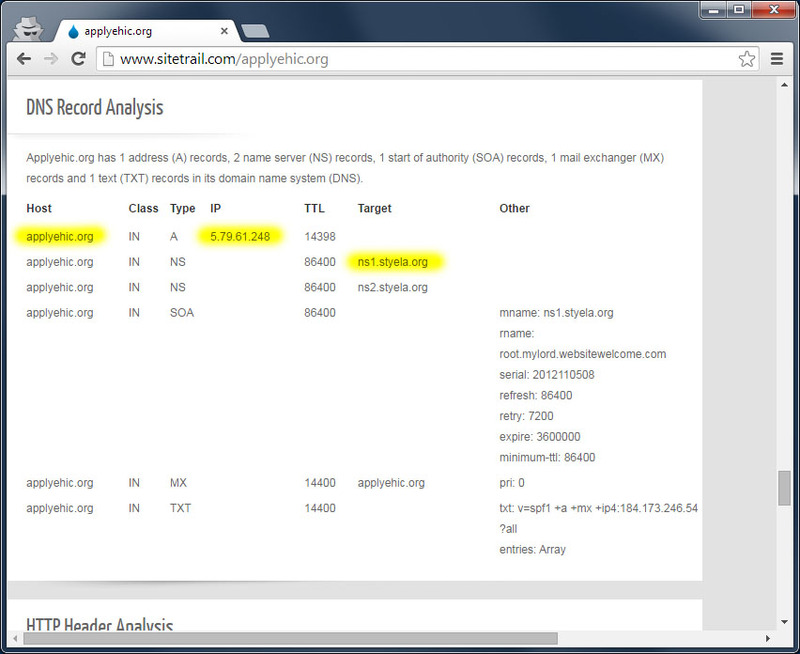 A further point of interest on the sitetrail record is the name server ‘ns1.styela.org’. styela is an unusual word. Google it and you’ll learn that ‘Styela is a genus of tunicates.’ Still none the wiser? Somebody was getting a bit cute when they dreamed up that server name. 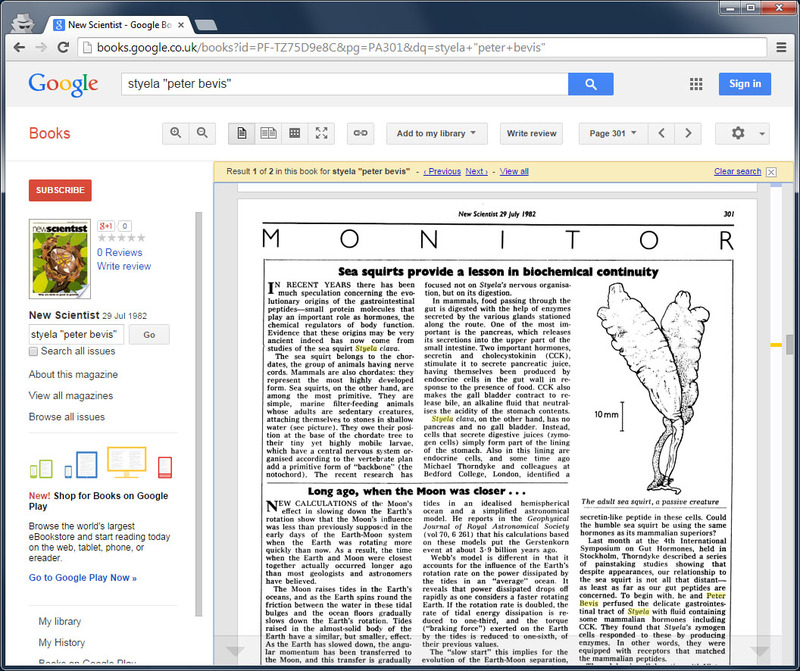 Let me refer you to this 1982 New Scientist article describing Peter Bevis’s work on the sea squirt Styela clava. Peter Bevis is the Managing Director of Highland Titles. Given we have a certain connection back to the company in the IP address, the link back to Managing Director Peter Bevis’s PhD days in the name chosen for the server is unfortunate. 3. The applyehic.org application forms were hosted on eu-healthcard.eu. The links can still be seen in the archived copies. WHOIS searches on eu-healthcard.eu also revealed nothing… unless you used the search tool provided by .eu domain manager EURid, which revealed everything. The website was registered to ‘Bevis, Peter’ of ‘Universal Check Services’, using the familiar Belgian mailbox as mailing address and his date of birth as email address. 4. A company called ‘Quality Design (CI)’ based in Alderney filed a US trademark application on the word ‘EHIC’ on 26th October 2010 (here). The individual behind Quality Design is known from a UK trademark application filed by ‘Peter Bevis Trading as Quality Design’ (here). 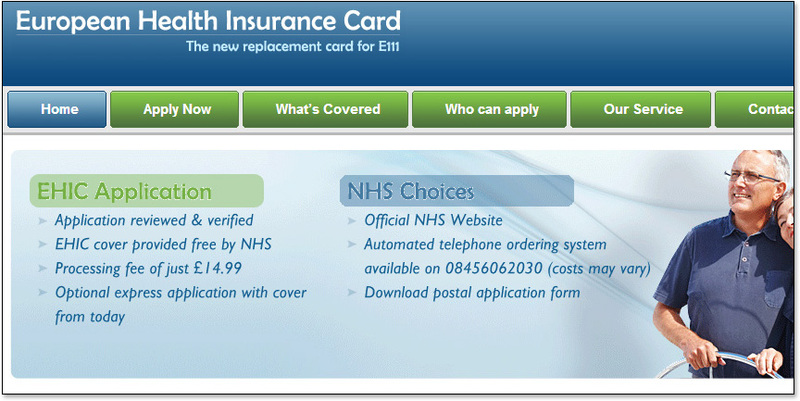 Also on 26th October 2010, a European trademark application was filed on the word ‘EHIC’ (here). (This one was granted, so the NHS needs to be a little careful about how they’re using someone else’s intellectual property!) Examining the correspondence recorded against this trademark, we see that the application form was submitted by Peter Bevis, Director, Quality Design (CI) Limited. The two correspondence items of 12/08/2011 are illuminating. They record the transfer of the ‘EHIC’ trademark from Quality Design (CI) Limited to Uccle Limited, a Seychelles International Business Company. Peter Bevis signs this document as Director, Quality Design (CI) Limited and as Director, Uccle Limited. He also signs this document for both companies. Uccle Limited is Seychelles International Business Company No. 94913. Perhaps Bevis found the Alderney tax regime too punitive? Uccle holds a trademark on ‘ApplyEHIC’ (here). Even the summer work experience person was in on it. She is the signatory of an application by Uccle to trademark ‘E111’ (here). The lengthy correspondence under another Quality Design European trademark ‘Order of the Black Ermine’ is intriguing. An unsuccessful opposition was filed by a Richard Holland, who alleged that this was a ‘bad faith’ trademark application as part of a ‘dirty tricks campaign’ in that he had been selling membership of the ‘Order of the Black Ermine’ for some time previously. Quality Design’s response to the trademark office (here) is patently dishonest (‘Exhibit 1 refers to a Company Lochaber Highland Estates Ltd. Quality Design (CI) Limited has no connection to this Company.’). 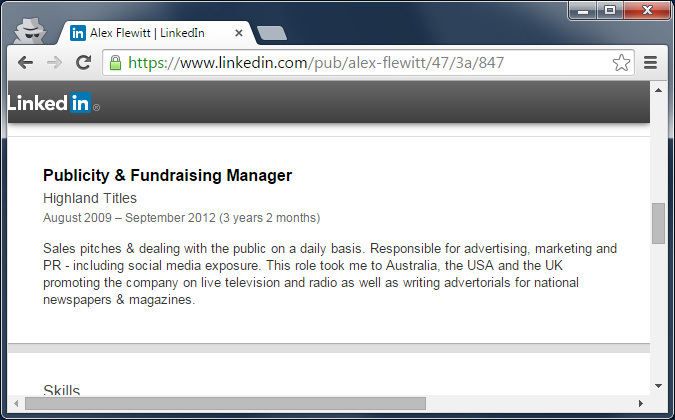 The response is signed for Quality Design by Alexandra Birch (now Flewitt) who, according to her LinkedIn profile (screenshot here), was at the time of that response ‘Publicity & Fundraising Manager, Highland Titles’ (then known as Lochaber Highland Estates). The correspondence accompanying the US ‘EHIC’ trademark application is also an eye-opener. The application was refused (here) because the specimen (an EHIC card) was not a product in its own right. Bevis countered 2 days later (here) by claiming to operate a business selling novelty EHIC business cards and submitted a new specimen depicting a novelty EHIC business card. 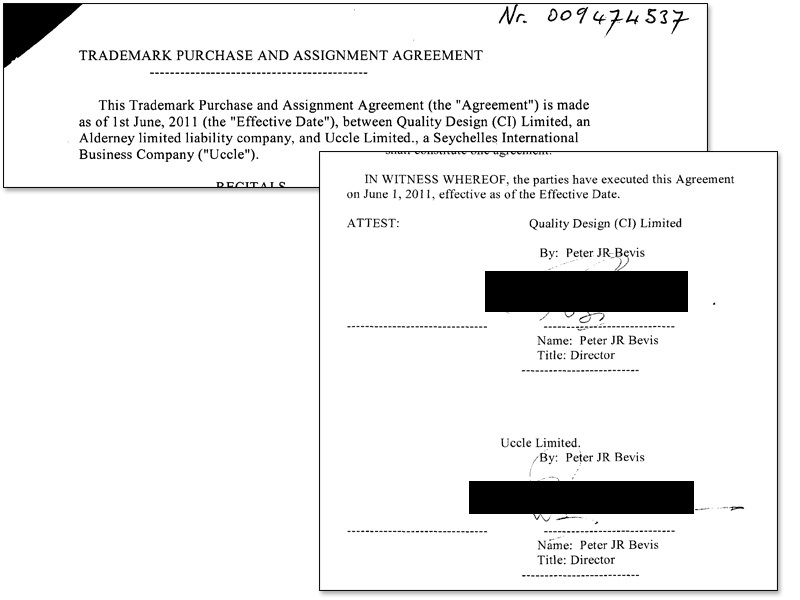 Bevis signed a ‘declaration in lieu of an oath’, under penalty of perjury, that this new specimen had been in commercial use since the original filing date about 3 months prior. 5. The next one is a bit embarrassing, given the efforts Bevis had made to conceal the Highland Titles involvement. 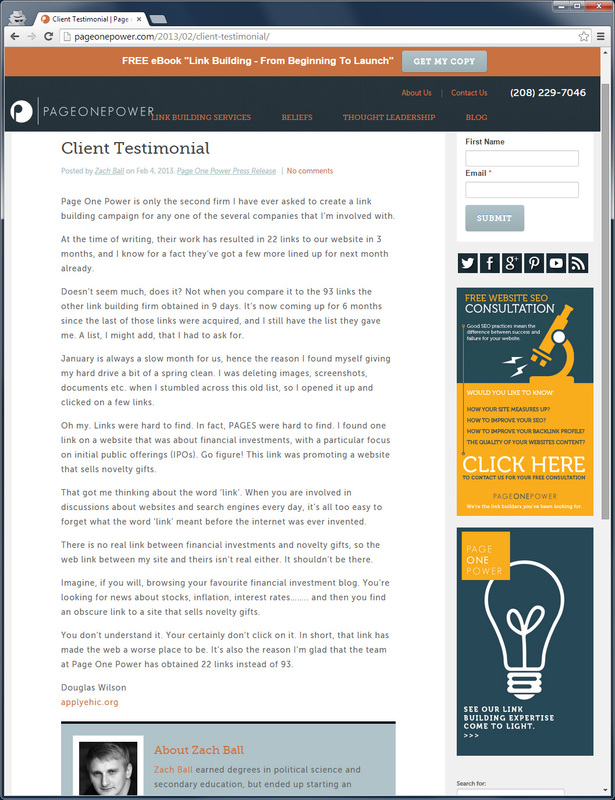 His son-in-law and Highland Titles co-director Douglas Wilson clearly didn’t get the memo about it being a good idea to keep the ripping people off hush-hush, and wrote a lovely client testimonial for ‘Page One Power’ as ‘Douglas Wilson, applyehic.org’ (archived here). Oh dear. 6. Case closed, really. There is a good deal more, but it’s not needed. I will just note in passing that an earlier copycat operation exposed by the Mirror, the Telephone Preference Register, appears in Alderney government records (here) registered at the address of Highland Titles, and with Highland Titles’ Finance Manager as Company Secretary. So that’s who was behind it. And if the Earl of Bradford is to be believed, these are not nice people. The Earl has publicly accused Peter Bevis (here) of being responsible for a cyber attack reported in the Evening Standard (‘Cyber attackers target restaurateur earl ‘for warning against buying fake titles’’, here). Cunning mock-ups of the Telegraph and Evening Standard websites were used to publish fake articles about the closure of the Earl’s Covent Garden restaurant due to an outbreak of food poisoning caused by poor hygiene standards. 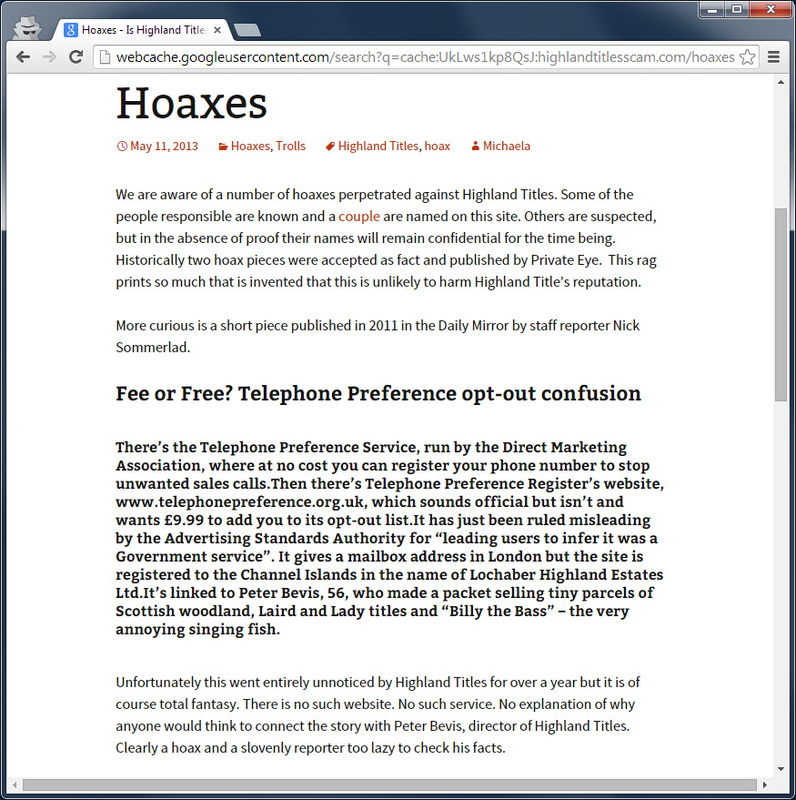 Tellingly, the only response to the Earl’s accusation so far has been a (now deleted) blustering denial on pro-Highland Titles site highlandtitlesscam.com (‘Having finally caught my breath, I would advise you to treat this with the contempt that it deserves… To invent such a story is sad. To lay it at the door of a man with charitable intentions and a track record of good works is nasty…’). Bevis is wealthy and unafraid to litigate. He brought an action against Highland Council in the Edinburgh Court of Session (March 4th 2011), and last year engaged a prominent law firm to advise on a damages claim against the Scottish Charity Regulator (nothing came of it). If the Earl’s accusation is false, libel proceedings should be expected – court orders can then be obtained to determine the ownership of the pages, how they were disseminated, and such. We note that technically the fake newspaper websites used were essentially identical to those used in the Highland Titles doctored press coverage episode reported in Private Eye #1339. We note also that a Wikipedia account that can be linked with confidence to Peter Bevis (here) was used to edit links to the Earl’s website faketitles.com to point to a (now defunct) malicious clone fake-titles.com (note the hyphen). The edit was reverted as vandalism: ‘(Undid revision 452879185 by Theblackbadger (talk) Vandalism; link to hoax copy site)’. The harassment of the Earl is not, it may come as no surprise, an isolated case. Other victims have been subjected to arguably worse attacks. The labelling of the Private Eye doctored press coverage story as a hoax is also interesting. Bevis has stated or implied this several times on Scottish clans blog Bletherskite and elsewhere (e.g. here). The story was, of course, not a hoax or his lawyers would have had a field day. Indeed it is confirmed by this Freedom of Information response. We have no idea what relevance Japan has to the argument – Highland Titles is selling land (or not) in Scotland, not in Japan. In fact, Lochaber Highland Estates was first registered as a Scottish company (#SC232098). Subsequently Lochaber Highland Estates (C.I.) Limited was incorporated in Alderney on 30th October 2006 (Company #1599), moving the proceeds of the Scottish land sales (or not) out of the reach of the Scottish taxman. Journalist Mike Wade wrote (here) that, ‘He [Bevis] shrugs off any suggestion that he avoids British tax – ‘the business is registered in the Channel Islands because that’s where the family’s from’’. It would be easier to take this at face value had it not been subsequently discovered that Bevis has another business registered in the Seychelles and that the Bevis family’s Tulloch Farm, where they have their Scottish home, is owned by an entity in the British Virgin Islands. Presumably both for tax reasons, or perhaps the family’s from the Seychelles and the Caribbean as well. Bevis occasionally invites his critics to visit the Highland Titles Nature Reserve and see for themselves what he is doing. Unfortunately for him, I did. 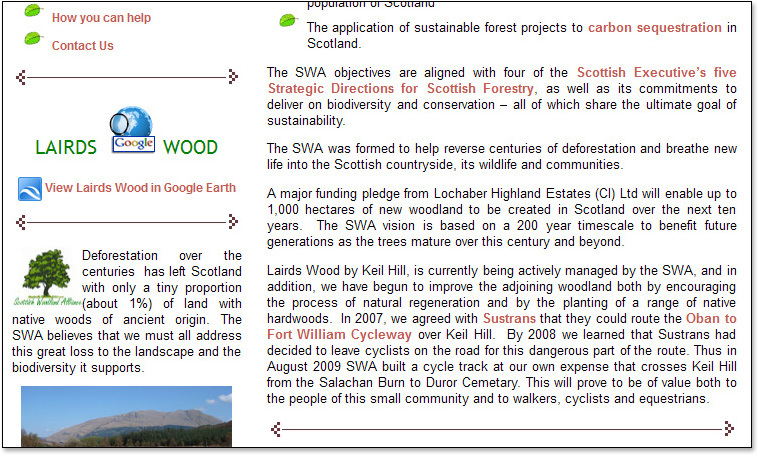 In 2013, I walked the ‘cycle track’ that they claimed (archived here [the SWA is another Bevis outfit]) to have built in 2009 to take cyclists off a dangerous section of the A828. My photos appear in this blog (not my blog). 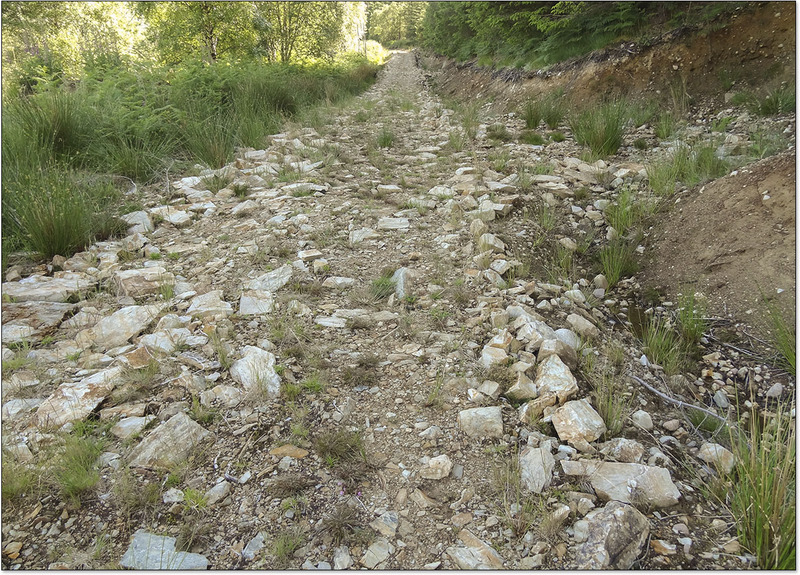 The ‘cycle track’ was strewn with rocks and patently unsuitable for road bikes. Access at one end was through a closed farm gate and over stepping stones across a burn. The track was not built as, or usable as, a cycle track, and it is vanishingly unlikely that in the 4 years of its existence a single cyclist had used it to bypass the A828. It is likely that the track was in fact built with extraction of the commercial timber crop in mind. I also walked the length and breadth of the Reserve looking for the 60 acres of broadleaf trees they claimed to have planted in 2012. By their own estimation, this amounted to 30,000 trees. I could not see a fraction of that number. This observation was later confirmed by Highland Titles’ five-year plan document (here), which reported 5,000 trees planted in the first 5 years (1,000/year, give or take). Their local representative posted on Facebook (11th Feb 2015) that the figure is now ‘around 8,000 trees planted’. What can you even say about exaggeration on this scale – planting one or two thousand trees in 2012 becomes ‘During 2012, we have planted 60 acres [30,000 trees] of broadleaf trees…’? Bevis himself claimed that Highland Titles had planted 10,000 trees at Keil Hill during winter 2011/12, branding one doubter ‘a fool and a liar’ (here). As we now know, it was Bevis who was lying. It is disturbing, to say the least, when the head of a supposed conservation organisation writes clear and deliberate lies about the conservation work carried out. 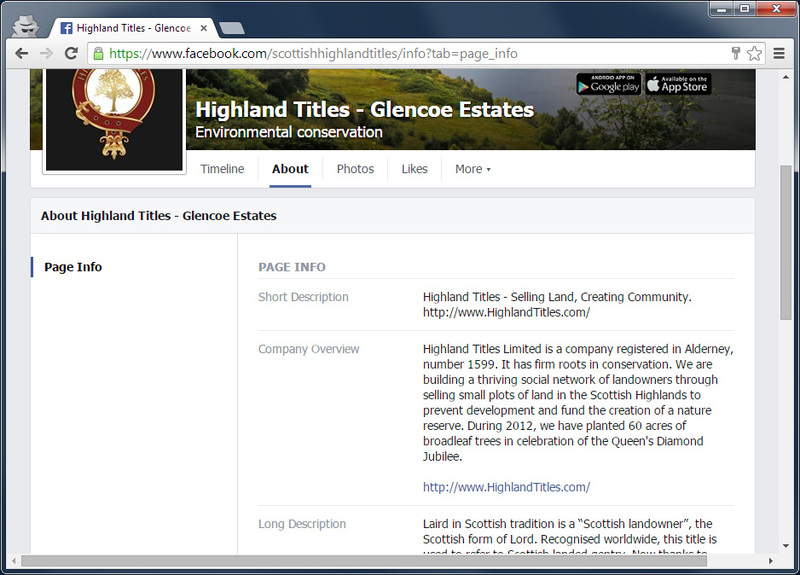 Highland Titles is wholly owned by a Guernsey charity, the Highland Titles Charitable Trust for Scotland. And the only function of the trust is ‘to own the sole share of Highland Titles Limited’. The trust thus controls Highland Titles Limited. The original trustees were Bevis and his daughter, replaced in 2014 by his wife and son-in-law. Highland Titles describe themselves as a ‘conservation organisation with a difference’ (here). And what a difference – Bevis and his mob run scams, they harass, they deceive, their tax arrangements are a creative fusion of the Caribbean, the Channel Islands and the Seychelles, and their claims of work done are exaggerated to the point of fabrication. All very enterprising – most UK conservation charities look terribly staid by comparison, and are hamstrung by the tiresome obligation, spared Guernsey charities, to publish accounts. With plot sales now up to 200,000, and plot prices ranging from £30 to £500, Highland Titles is a highly profitable enterprise. Fearful that the wheels were about to come off their money-making machine, they have in the last year or so been scrambling to build a veneer of credibility. They have attempted to buy local goodwill (with mixed results – some local bodies have refused to take their money; the local marketing association ‘Discover Glencoe’, on the other hand, has embraced them, despite one of their members resigning in protest), and have been spending more conspicuously on the Reserve (although this blogger has done the maths, and is not impressed). Will they pull it off? Stranger things have happened. To contact the authors, submit a comment and mark it not for publication. Not that we are likely to publish any comments anyway.